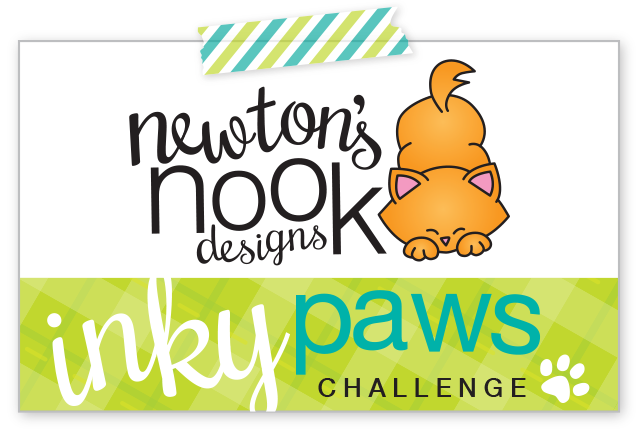 Hi everyone, welcome to the final, Day 4 of our January Release over at Newton's Nook Designs! Today, I'm featuring another adorable set called, "Newton's Happy Mail". This is a coordinating stamp and die set. I really enjoyed copic coloring this image, I love the way Newton is poking out of the mailbox, handing you the mail! I distress inked the image on top and bottom with Shabby Shutters and Broken China for grass and sky. I then mounted the Newton image on two layers of MFT stitched ovals. The plaid paper is from Lawn Fawn, "Winter Plaid" and the grey cardstock is by MFT "Steel Grey". Thanks for visiting and don't forget, you could win this stamp set!! 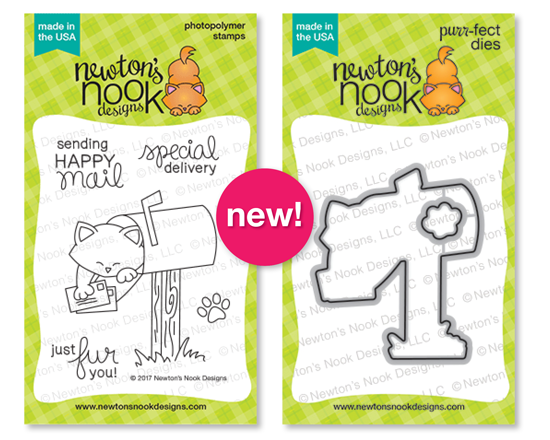 Would you like to win the “Newton's Happy Mail” Stamp Set? Love your coloring - that stamp set is adorable!!! Love this set and especially how you colored Newton and created the scene using the distress inks! Beautiful card. Love the coloring on your Happy Mail card! Sweet card. Love the background. Great card, this is an adorable set! Adorable new release, this set is so useful! I'm a great Newton's lover and you coloured him so well!!! Fabulous fur and mailbox shades! Thanks for the chance, I would love to win this set! That is adorable! I would love to win this set, it would be perfect for cards to my pen friends - and everyone else. Beautiful card! I love the shading in the background - guess I will have to start getting some of those distress inks after i get this adorable Newton set! Cute post themed card. Hehe. Wish I had this one, would be perfect for the post delivery men/women in our countries (if they are cat lovers by the way)..
Love this stamp set! And you did a great job at showing it off! Oh too sweet! super cute! Beautiful coloring and I like the oval dies you used. Such an elegant card. I love your choice of colors, dies and papers. The grey works beautifully!! Love it. The critter is super cute :) thanks for sharing. I love that you colored this cat to look just like the real Newton. Your coloring is great! I'm not good at making tabby cats! I love the more masculine colors you used. This gives me inspiration for a valentine day card for a guy! Simply adorable! Both your card & this new set. I love this kitty card! Such a darling card! I really like how you colored Newton. Sweet card and great clean design. Darling card! I love the layers and papers! Great coloring and details! I love this set! !I would love to send Happy Mail to Japan with this set. Is there anyone who wouldn't love to receive happy mail from Newton?! I love how you colored this, and created the background for the stamp to be anchored in. It looks lovely but makes Newton and the mailbox the star of the card. Thank you for inspiring me. I love this set and the whole release and am so impressed with the work you did on each and every project. This is gorgeous, AJ! I love the Distress ink colors you used - your blending is just masterful! The stitched frame is a cool detail that adds so much pop to your card. Wonderful ink blending and coloring! What a wonderful card--I love everything about it! The paper, the coloring, the ink background, the die cut mats--just wonderful! I love getting and sending happy mail. This is a beautiful card, love the coloring and especially the colors. Beautiful. Adorable scene! The stamp really pops out! You did a wonderful job! Great card! Love the twine with the metal button, a real nice extra embellishment on your card! SO cute! Lovely background inking and perfect colors/papers.